If you've ever worried that you aren't getting sufficient levels of certain vitamins and minerals in your diet or your doctor has diagnosed you with a deficiency, you may have considered taking a multivitamin. But while the value of multivitamins remains a question, gummy vitamins specifically may do more harm than good. "Added sugar should be kept to a minimum in any healthy diet, and popping a few sugary gummy vitamins per day can add up," she said. "In fact, some gummy vitamins can contain nearly one teaspoon of added sugar per two-gummy serving. Some of these also include sugar alcohols, such as sorbitol, which can cause digestive upset in some people." Additionally, ingredients like artificial food coloring, preservatives, and fillers are commonly added to gummy vitamins to enhance color and texture, Jillian explained. This can come at the expense of the nutrients themselves - fillers and sugars take up space, leaving less room for vitamins and minerals. Because they're so sweet, there's also the risk that children - and even adults - will mistake gummy vitamins for candy. "Unlike water-soluble vitamins, fat-soluble vitamins (A, D, E, and K) are stored in the body and can cause toxicity if too much of these nutrients are consumed," she said. "Certain minerals, such as iron, can be dangerous if consumed in excess as well." So while gummy vitamins can be a good way to sneak in extra nutrients, they should be used as a last resort after other supplement forms such as capsules and powders. 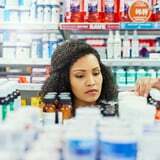 "It's also not necessary for everyone (kids and adults alike) to take a multivitamin, so it's a good idea to consult a health professional before starting a supplement," Jillian said. Whatever you and your doctor decide, stick to the recommended dose and keep vitamins out of reach of children.